My classroom has been very busy! We're packing in tons of stuff before we leave for Spring Break. So I thought I'd share a LOT of pictures and other info in this post. 1. I FINALLY FINISHED my Spring Centers! I'm super excited about this pack. 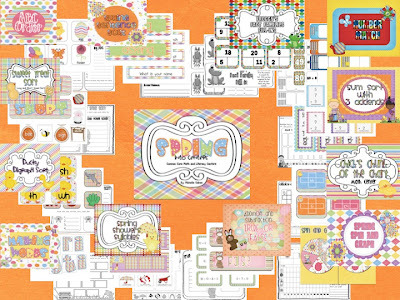 I love the colors and I feel like I hit a bunch of first grade standards, which its a necessity now that we're only 30+ schooldays away from summer break. All of these are based on the common core. The standards covered are listed with the directions for each center and all of the centers come with an assessment/recording sheet. You can check them out by clicking HERE. 2. I've had quite a few emails about how centers work in my room. I have 6 centers each week. Math, Word Work, Sight Word, Book Center, Poetry Center and Listening Center. 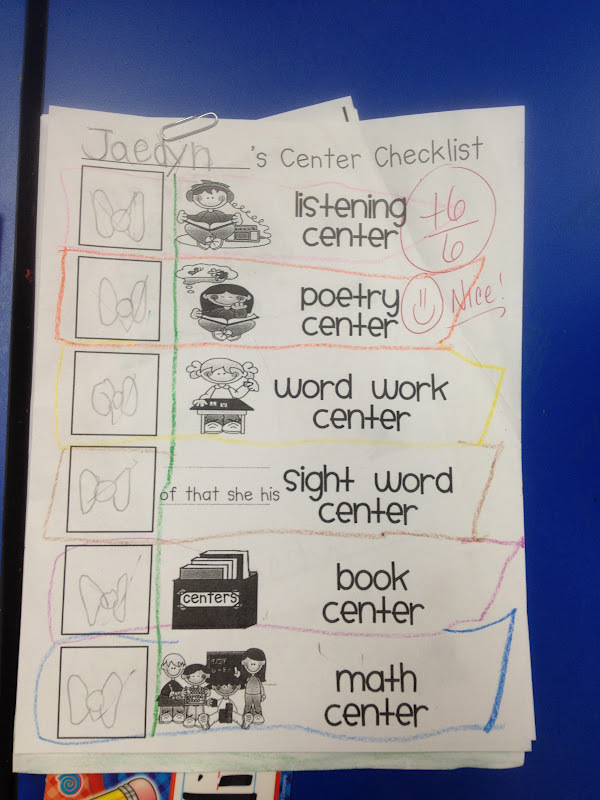 My students get their center checklist on Monday and choose a center. I don't worry about who goes where, they know that if a center is being used, they need to choose another. I try to make several copies of one center, so there are plenty to go around. This week, students did a long and short vowel sort for Word Work center. I made 3 copies of this center and they can work in partners, so 6 students could be completing this center at once. I also have three Leap Pads, 3 iPods and 1 iPad. If they go and get a listening center recording sheet and all of these listening devices are being used, then they need to choose another center. 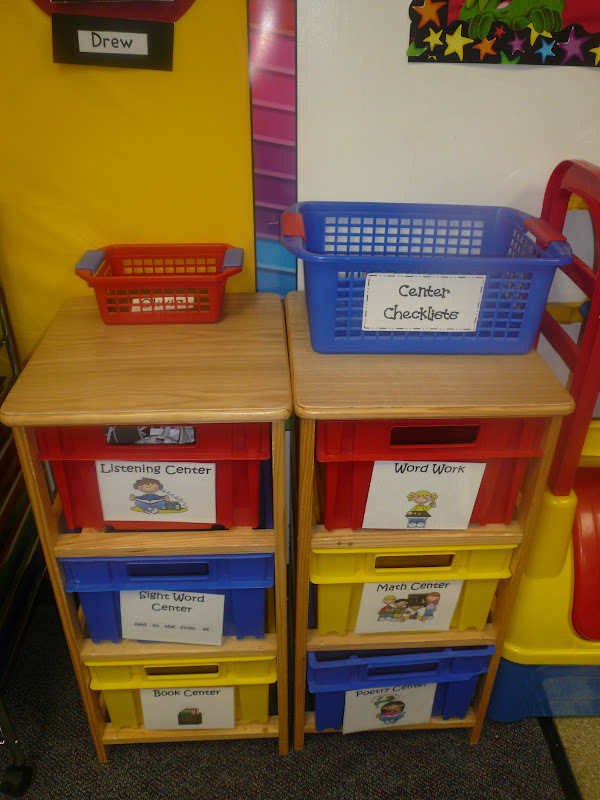 Students get the recording sheets and centers located in one of my 6 center bins. They keep their center recording sheets in a folder in their chair pockets when they complete them. 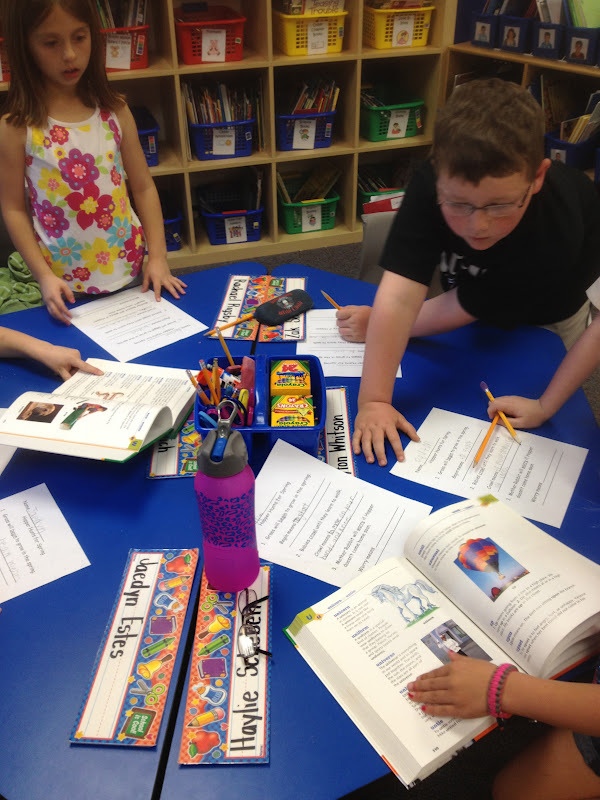 We do centers 4 days, Monday through Thursday and students must get 4-6 centers completed each week. 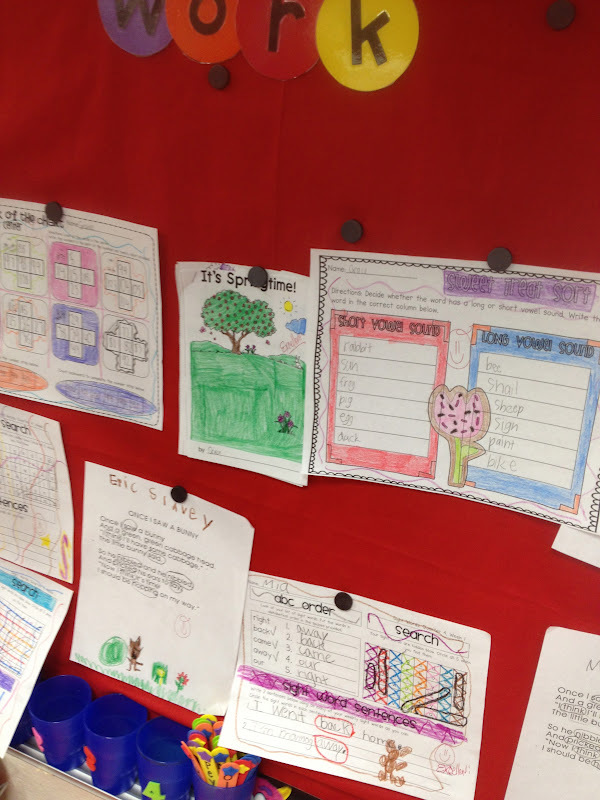 Students who get 6 centers completed correctly and neatly get a special incentive. I also choose work that is especially well done for our "Beautiful Work" board and those students get to choose a treat on Friday. I try to make all of my centers hands on and interactive, but also insist a recording sheet is included for accountability and assessment of progress. On Thursdays my students turn in their center checklist and completed center recording sheets and I paper clip their papers together so I can look over them. On Friday, I hand back their packet, which is a very big deal, as treats for great work are announced. Center Bins: Centers and Recording sheets are located in these. 3. We've also been learning all about spring and rabbits. We'll be doing lots of fun activities from my Rabbit Unit this week. Last week, we read Hopper Hunts for Spring and listened for the verbs in the story. 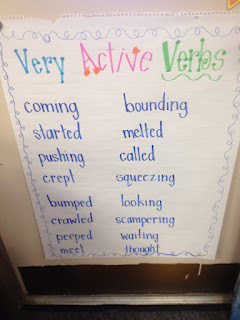 We made a list of verbs and then used those verbs to do a little dictionary skill activity. My kiddos had a blast. They were racing to be the first team to find the verb in the dictionary. 4. We've also been learning about asking questions before, during and after reading. 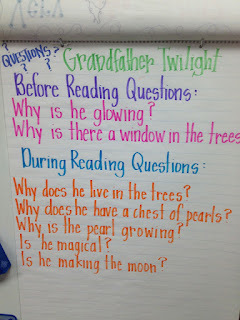 We've been reading the book Grandfather Twilight. This is a great story for introducing these skills. Here are some of my kiddos great questions. If you need ideas for comprehension, I can't recommend Debbie Miller's books enough. I have a pack in my TpT store full of graphic organizers that go with her book Reading with Meaning. We'll be using some of them with this Inferring and Questioning unit. 5. We've been having an excellent time with our now!Board. I absolutely love it. 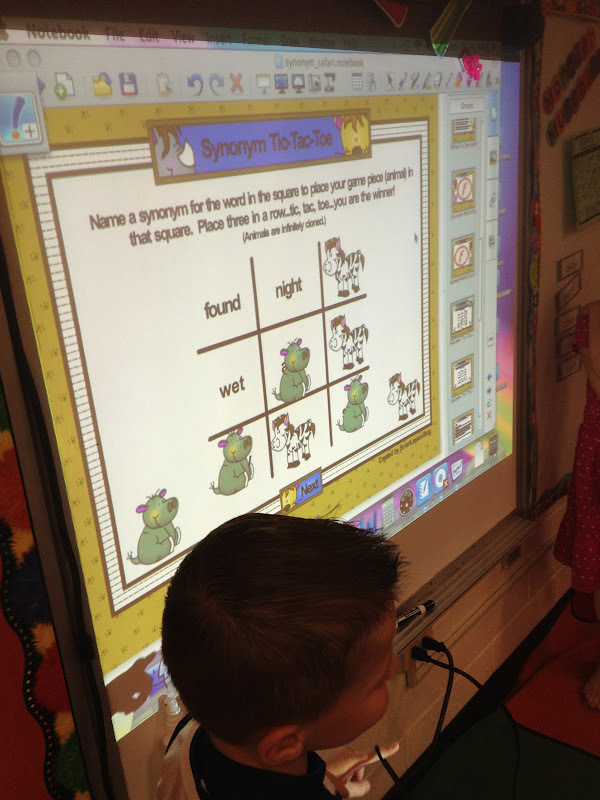 I had a few people ask if I would choose a SMART Board or the now!Board and I thought I'd let you know that I honestly prefer the now!Board. We do not have mounted SMART Boards in our rooms. And in my opinion, if they aren't mounted, they aren't worth it. They don't calibrate well, the minute anything is moved they don't work, and they take up way too much room. 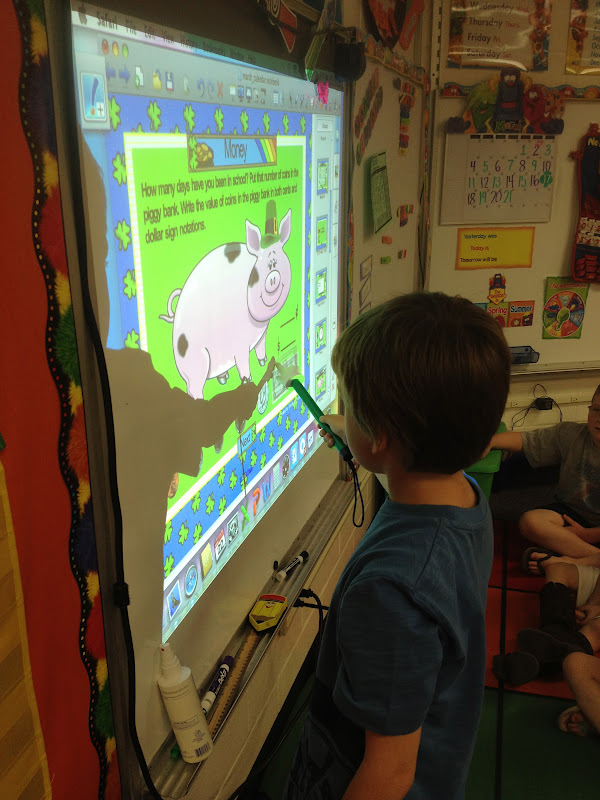 That being said, there is so much more out there for SMART Boards, as far as lessons. I do know Carson Dellosa has released lessons for use with any interactive white board. They asked me to review it, but at the time, I didn't have anything to try it out with. But it looks great! Here are my kiddos and the board. Also! The winner of my 100 dollar Learning Resources gift card has been chosen. Check out the post below and see if it was you! I hope you all have a great week and if you are on Spring Break, enjoy! I tried to be a little more clear above and included another picture. My center time includes those 6 centers. 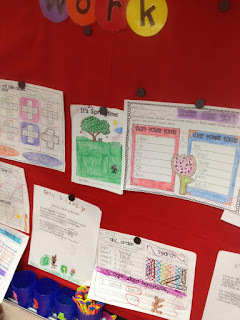 We do play math games and other math activities that go along with our Investigations program during math time, but I do a math center during my center time while I'm doing guided reading as well. Girly you are too cute! I love your Spring colors and seeing the kiddos at work. You centers sheet looks clear and easy. Lakeshore has interactive premade activities as well. So here's a question...how do you provide directions for the centers? 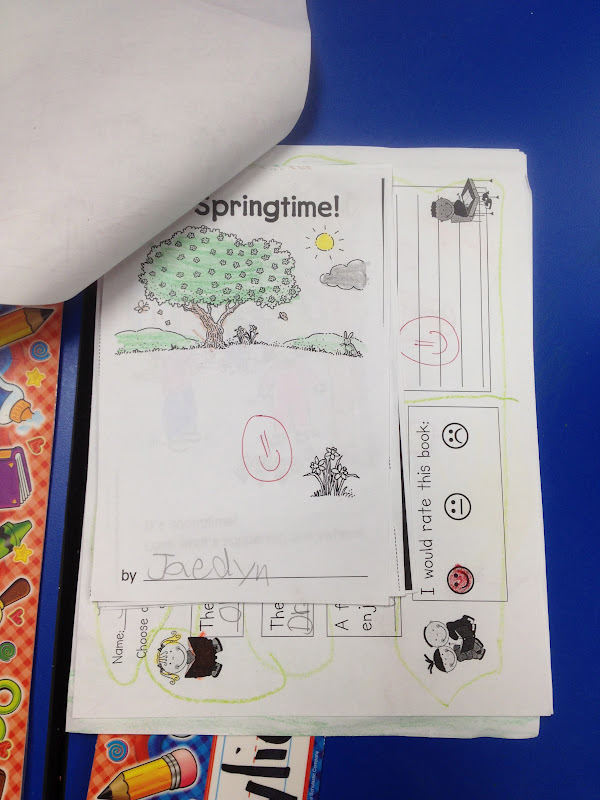 I just have some sweet little first graders who I know struggle to read directions still. I love how you hang up the great center work and present awards. I'm sure this makes them even more accountable!! BTW: Your centers are always great!! Thanks so much for the explanation I have been struggling tryig to do something like this but couldn't figure out how! How do you use the cookie sheets I saw in a previous post? Love all your center, I am so happy with evey purchase I have of yours! Thanks for all of the information! I'm still trying to get my centers/guided reading time to work for me. You mentioned a recording sheet for the listening center...would you be willing to post a picture of what it looks like? @ Kirsten. I have some listening center sheets on my website: www.fantasticfirstgrade.com and I also have kids use sheets from my Reader's Response sheets of Teachers pay Teachers.